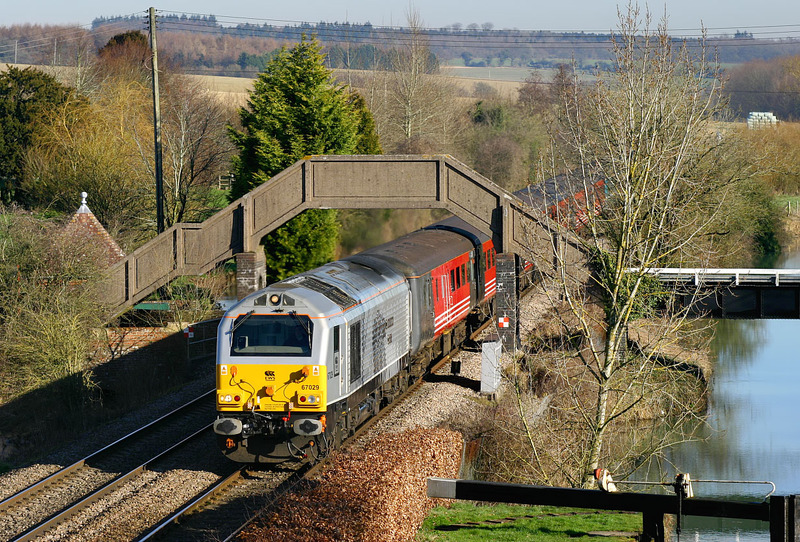 67029 Royal Diamond passes under the footbridge next to the Kennet & Avon Canal at Little Bedwyn with the 1Z31 09:28 Paddington to Cardiff Central rugby special on 9 February 2008. Hidden behind the bushes on the rear of the train is 67024. This train was run in connection with the Wales v Scotland Six Nations match at the Millennium Stadium. Unfortunately the beech hedge in the foreground means it is now impossible to do the standard picture here in the winter, including both the church and the lock, as the hedge now shades the line.